Announcement Spring cannot come too soon! Due to life toppling over and trapping me under a pile of reality, I'm officially taking commissions, but if you have a really neat project you're wanting, please do inquire--I'm at least able to answer questions or let you know what kinds of things are possible, and if you don't have a tight deadline for your project, I may be able to do it over a few weeks. If you don't see what you're looking for, feel free to ask about specific designs, etc. and I can let you know if there's anything upcoming that might be up your alley. The designs at Sova Leatherworks are influenced by Art Nouveau, Victorian, Celtic and Modern aesthetics, plus a whole lot of geekery. Books, games, films... if I love it, I'll most likely make something inspired by it. Want to ask about something I've made, or suggest a new project? Find me on Facebook! (addresses at the bottom) I'll be posting pictures of current projects, and various flotsom about leatherworking in general. Spring cannot come too soon! There's something so satisfying about holding something you know is made to last. When I was small, my family drove through the Rockies to Yellowstone Park. Though the geysers were impressive and the vistas were gorgeous, the thing that most captured my attention was elderly leathercrafter at The Old Faithful Inn who etched illustrations onto leather. The smell of the leather was intoxicating, and, fascinated, I found myself hanging around watching him work. He kindly tolerated this annoying little kid, and thoughtfully answered each of my questions - as though I were another grownup. At the end of our stay, the gentleman offered to etch a picture for me, and I requested (god knows why this in particular) "an elk - bugling, please" For most of the drive home, I sat smelling the leather and turning the drawing over in my hands. Today, that little elk picture hangs in my studio as a reminder that regardless of which paths I took in between then and now, this has been a dream of mine for a long, long time. I like making things, especially if those things make people happy. Also, I am a bit of a nerd. Welcome to Sova Leatherworks! 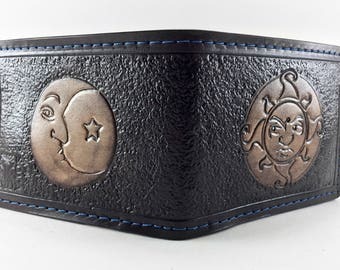 Here, you'll find quality handmade leather goods at reasonable prices. I have a lot of fun doing projects based on the things that I love, and it entirely makes my day when someone else gets a kick out of them too.